Now, this is a cleat not to be ignored. 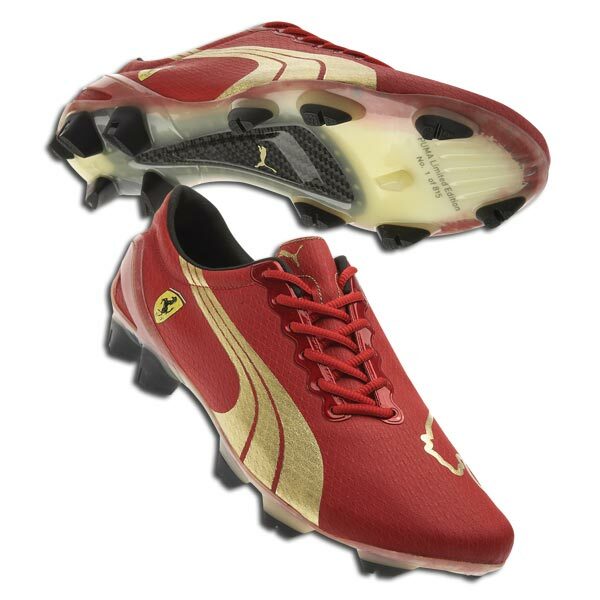 Puma have teamed up with none other than Ferrari to create this cleat that is bursting with speed! Ferrari have been one of the dominant forces in Formula One history, and are renowned for their classy, powerful cars. It took over two years for this cleat to be created, showing how much has gone into creating such an innovative cleat. The PUMA v1.815 i FG Ferrari is one of the lightest and fastest boots on the market, and only 815 pairs of this limited edition boot are going to be available worldwide! UPDATE: Since we posted about the Puma V1.815, they have sold out, although a few pairs have popped up for sale on eBay! They are developed using Puma AptoLast insoles, that conforms to the foot’s natural curvatures and provides a glove-like fit. A heat-cut design provides additional flexibility and softness, while off-center lacing increases the striking surface and helps improves ball control. Carbon Filter composite inserts help create an added sense of speed and comfort. Add to this the fact that Puma has created a cleat at 5.8oz in weight, and you have the ability to really take off in a split second, meaning you get to the ball before your opponent! I am impressed by the look of this cleat, its sleek and I am a fan of Ferrari. The colorway is extremely sharp and since there are only 815 pairs of these cleats available, there is an air exclusivity about them. But, with since they are limited edition you also get an increased retail price and the v1.815 i FG Ferrari clocks in at a hefty $349.99. Anyone considering splashing out on a pair? I WANT TO KNOW IF I CAN GET SPONSORED BY PUMAS. I CAN SEND A VIDEO TO SEE MY SKILL LEVEL. When Are They're Going To Make More?